Youth and creativity is often a strong and necessary catalyst to inspire positive, lasting change. In early June, a dozen University of Oregon architecture students lent their minds to take on the colossal task of re-envisioning the now defunct Blue Heron Paper Mill site in Oregon City. Each student selected a theme, bringing his or her own creativity and imagination to this historic undertaking. The results, elegantly laid out in the top floor of the White Stag Building, are stunning representations of a vibrant future for the now decrepit site. “It was quite the labor of love,” said Becca Cavell, Principal at THA Architecture and co-instructor for the two-term seminar. The students presented top-notch proposals to members of Metro staff at a design exhibition held on June 12th. The proposals were final projects for the inaugural John Yeon Studio for the UO Department of Architecture (Portland), taught by Cavell and the Yeon Center’s Randy Gragg. Each student proposal had an explanatory poster with renderings accompanied by a scaled-down wood model, which was laser cut on-site at the studio. While many of the students revealed plans to remove the industrial sites along the Willamette River, all proposals were unique and provided a fresh new view of what “could-be” at the location. These representations will help Metro conceptualize the schematic design process that has started with the selection of Meyer/Reed, Snøhetta, and Dialog as the design team for the Riverwalk. Metro Principal Regional Planner, Dave Elkin looks on from the site model as studio instructor Becca Cavell explains student work (Credit: Eric Hawkinson). Adrienne Fainmen’s final project for the John Yeon Studio shows her dedication to tribal connections (Credit: Eric Hawkinson). 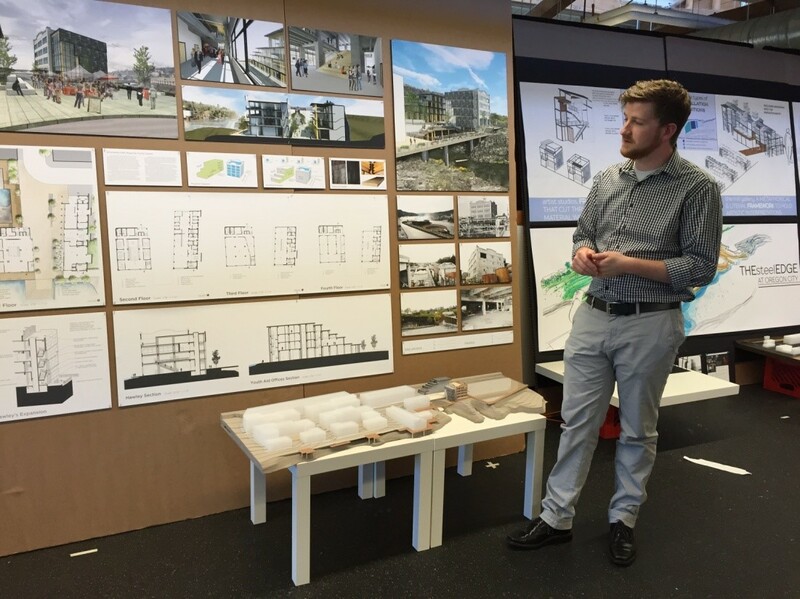 Jacob Simonsen describes his final project (Credit: Eric Hawkinson). One idea that is popular with Cavell is the prospect of using the site as a transit hub and destination for the Amtrak. She said it is important for the station to be there to bring people to Oregon City to truly witness the wonder of the falls.“We have a student who takes the train everyday from Salem, and he says ‘everybody goes silent when the train passes the falls.’” Cavell said. Any supporter of the Willamette Falls Legacy Project understands the untapped potential and momentous opportunity at the Blue Heron Paper Mill site, bringing people back to the falls. While some of these students’ brilliant ideas may never come to fruition at the site, supporters should be encouraged by the growing excitement and engagement occurring across the state.